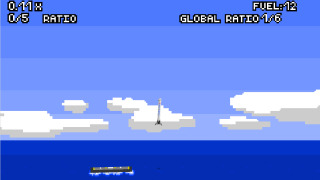 An 8-bit game has emerged this week that takes on SpaceX's test mission to try to land its Falcon 9 rocket on a floating barge in the middle of the Atlantic ocean. While the rocket landed successfully, it unfortunately tipped over and exploded. SpaceX, which was founded by Tesla mogul Elon Musk, has plans to launch a privately-owned ship into orbit and have it return safely to earth. In the SpaceX Falcon 9 Lander game, which you can try for yourself here, you basically have to try to safely land a rocket on a floating barge using your keyboard to control thrust, rotation and decent, all the while keeping an eye on how much fuel you have left. If you miss the barge, you'll explode. If you land too hard, you'll explode. If you tilt too much, your rocket will fall into the barge or the ocean – and then explode. The game is a modified version of a Lunar Lander game made by a user named dixiklo using Scratch, a software created through the MIT Media Lab. We won't lie – it isn't impossible to land the rocket, especially if you've played similar arcade games from days past. But once you do succeed, check out your success ratio and be humbled.